There has been a proliferation in higher education in general, and engineering education in particular, as it has a direct bearing on the economy of the country. But maintaining a balance between supply and demand is always a challenging task. Unless the engineering institutes produce engineers who are employable in the market or be entrepreneurs, these large number of engineering institutes will be mere unemployment producing centres. Human resource planning has always been a challenging task at the micro or macro levels in a country. Time-based dynamic analysis would be of great help in strategic human resource planning. At the same time, the transition from industrial economy to knowledge based economy, has necessitated an efficient knowledge management (KM) at the national level. Hence, the time is now ripe to dynamically analyse human resource management (HRM) and KM through the development of an integrated model. ISO implementation in service industries has brought the term ‘core competence’ into the doorsteps of engineering institutes. Baker et al (1997), define ‘competence’ as the set of skills and knowledge that an individual needs in order to effectively perform a specified job. In engineering educational context, core competence to be possessed by the future engineers would be the knowledge, skill and attitude to be employable in the market or turn-out to be entrepreneurs. Despite the fact that this core competence has to be developed during the four year period of graduation studies, some may take less time (be employed during the third year itself through campus placements) or some may take more time than four years. This doesn’t rule out the possibility of rejection of the course by the students during the study, or take up higher studies after the graduation. 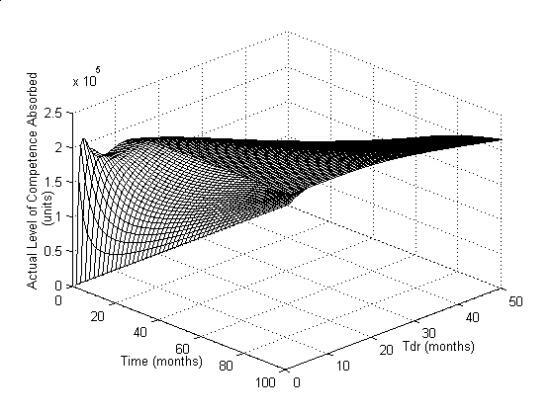 System dynamics could be of a powerful tool in competence pool mapping for varying values of competence gap recovery time (Tr), competence loss rate averaging time (Ta), competence training delay time (Tdt) and recruitment delay time (Tdr). The term ‘competence’ used in the engineering educational context includes- knowledge, skill and attitudes of the engineers/future engineers that would enable them to be employed in the global market, join for higher studies, or become entrepreneurs. Competence loss refers to the failure of the students to be employable, pursue higher studies or become entrepreneurs. The various specialized nomenclature used in this paper are defined in Appendix 1. · Develop causal loop diagram for KM of an engineering education system. · Develop the flow diagram of competence pool model (COPM) based on the above causal loop diagram. · Derive the governing equation of COPM based on which the system dynamics block diagram of COPM is developed. · Simulate the 3-dimensional graphs and generate the performance index table for the dynamics of KM & HRM. The model thus developed would give the conditions for optimum performance of KM & HRM initiatives, thus contributing to the policy scenario building and improvement on a continual basis. Engineering institutions are basically the knowledge repositories which exist to impart the required level of competence in the future engineers by imparting the underpinning knowledge, skills, attitudes, values, ethics and all other characteristics demanded by the engineering profession. Hence, the institutes should be equipped to transfer both ‘explicit’ and ‘tacit’ knowledge (Nonaka & Takeuchi, 1995; Routledge, 2000) to the future engineers through the well planned and organized curriculum. Human Resource Management (HRM) mainly involves planning, which involves five stages viz., analysis of the system, deciding the time horizon of the plan, forecasting the demand for and supply of manpower, reconciliation, and preparation of action plans (Tripathi, 2002). So, the study of the system forms the very first phase of the HRM. This issue is of national significance as the economy of the country is now tied to the database of the knowledge workers in this knowledge based economy. Defining KM is not only problematic but also varies from person to person based on the context and use (Neef, 1999, Bhatt; 2001, Raub & Rulling 2001). Turban & Aronson (2002), describe KM as a process that helps organisations identify, select, organize, disseminate, and transfer important information and expertise that are part of the organisational memory that typically resides within the organisation in an unstructured manner. We select only this definition as it is most appropriate in the context of this paper. System Dynamics (SD) is basically built upon traditional management of social system, cybernetics and computer simulation (Sushil, 1993). SD is based on the philosophy that the behaviour of a system is principally caused by its structure based on policies & traditions; and the structure of an organization can be best represented in terms of underlying flows of various resources cutting across the functional departments tracing across various feedback loops, delays and amplifications in the system. Hence, a SD model typically consists of ‘causal loop’ and ‘flow diagram’. The causal loop depicts causal hypothesis during model development, so as to make the presentation of the structure in an aggregate form, whereas, flow diagrams represent the detailed flow structure of the system in terms of the fine policy structures so as to facilitate the development of the mathematical model for simulation (Coyle, 1977). The research methodology is based on the SD methodology proposed by Forrester (1961) and is depicted in Figure 1. To start with, we performed the situation analysis, which included problem identification i.e. KM & HRM dynamics in engineering education and the study of the number of engineers produced in the country per year and their absorption rate. We then developed the causal loop diagram for KM & HRM (Figure 2). Jay Forrester (1961) did the pioneering work of system dynamic theory. Senge (1994) has used this theory very widely in developing the concept of Learning Organisation. Through the reference of these two, we developed the causal loop diagram (Figure 2). This considered the parameters which have significant influence on knowledge, skill and attitude development that provides the required level of competency to the engineers. We also considered, absorption of these engineers based the competency thus gained. A sustainable development of engineering competence has been the focus in the development of causal relations, as engineers who fail to develop the required level of competency to be absorbed in the market add to ‘competence loss’, which is in turn detrimental to the growth of the country. Various influences are represented in the form of feed-forward and feedback loops. 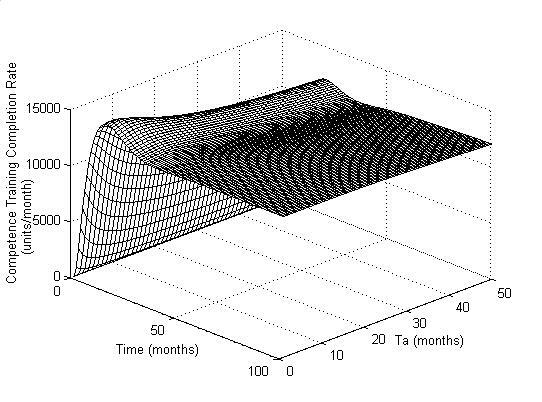 A computer simulation of this model is possible but is of limited use as the individual parameters change (e.g. recruiting rate) cannot be isolated easily (Hafeez & Abdelmeguid, 2003). The next stage was to develop the Flow Diagram (Figure3). This mainly illustrates the feedback (based on competence gap) and feed-forward control (based on forecast competence loss rate). In order to analyse the dynamic response we have taken time-based policy variables Ta, Tr , Tdt and Tdr as indicated in the flow diagram. During the ideal operation, the number of graduates produced equals the number of graduates absorbed in the market. But the problems arise when all the admitted graduates fail to acquire the required level of competence, and also, the market requirement for the skilled engineering graduates change due to several other governing factors, as a result of which, the recruitment may also be denied/delayed. So the above four policy parameters (Ta, Tr, Tdt, & Tdr) are to be varied to determine their optimum setting using simulation results. The influence of these parameters on the Competence Pool, Competence Training and Absorption Rate would provide useful input for policy makers. The governing equations giving discrete-time feed-forward and feedback difference equations used to calculate the system parameters are given in Appendix 1. The block diagram representation of the COPM is shown in Figure 4. We have used MATLAB Version 6.5 software to produce the simulation. The purpose of the entire system is to match the desired level of competence pool required with the actual level of competence pool absorbed. To achieve the desired level of competence pool, a simple appropriate policy is proportional control, where information containing the magnitude of the level (in the present case the competence pool) is fed back to control the competence training rate (Hafeez & Abdelmeguid, 2003). The competence training rate may be calculated by dividing the discrepancy between the desired and actual value of the level by a time factor, which represents the average delay in performing the training rate (Appendix 1). The policy parameters Ta, Tr, Tdt and Tdr are varied to determine their optimum settings using the simulation results. Once the initial conditions are set the system automatically simulates results for reaching the desired competence pool. We have taken the desired level of skill pool to be 250,000 engineers out of whom nearly one fourth i.e. 62,500 are unemployed which is considered as the competence loss (Sheshagiri, 2004). We have taken a delay time in training of 6 months to enable them to get the required competence level through training. We consider a drop out of about 5% of engineers, which includes the candidates leaving the course for all possible reasons. Therefore, the simulation model is subjected to some 20% increase in the present competence as shown in Figures 5a & 5b respectively. The simulation results are shown in the Figure 5 – 8. The Figures 5a, 5b, 5c shows the response of Actual Engineers Competence Pool Level, Competence Training Completion Rate and Actual Level of Competence Absorbed for a range of Tr values. 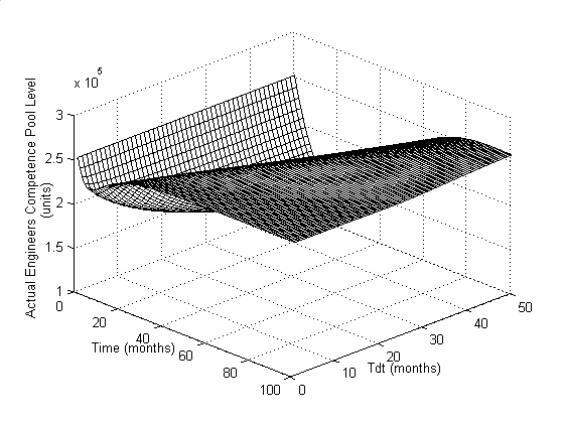 In the worst case (Figure 5a); the system would take 80 months to recover the competence loss if Tr is more than about 30 months. On the other hand, a small value of Tr would allow a quick competency recovery (about 5 months). But if Tr is fixed to be very small, unwanted oscillation in the competence skill pool may result for a long period (about 35 months). Hence, we can conclude that Tr has a higher influence on the system than the other policy parameters. Moreover, as per control theory this constitutes a bad system, as number of oscillations are supposed to be as minimum as possible. The Figures 6a, 6b and 6c illustrate the influence of Ta (Competence gap loss rate forecast averaging time) to control the HR and KM policy. The Figure 6a shows that as Ta is gradually increased, the overshoot becomes well managed but it also shows that it takes a very long time (about 40 months) to settle, which is unacceptable under any circumstances. 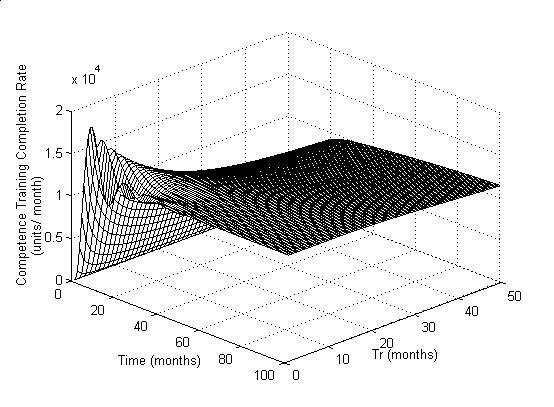 Figure 6b illustrates that increasing Ta decreases the peak value, thus the competence-training rate takes longer time to settle, indicating that Ta has significant influence on the system. Similarly, figure 6c shows that increasing Ta slightly increases the time for rise. The Figures 7a, 7b and 7c illustrate the influence of Tdt. 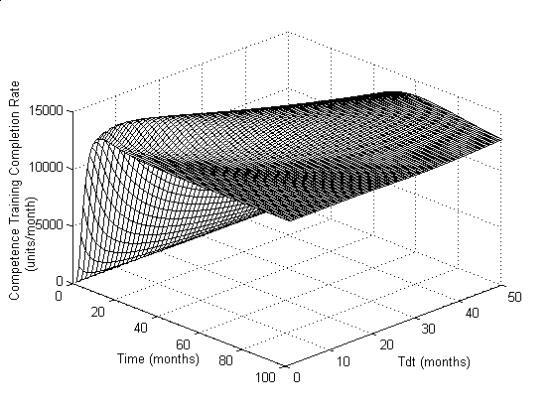 Smaller the Tdt values, quicker will be the competence pool recovery (Figure 7a). For values of Tdt upto 8 months, slight rise in Tdt will cause increase in competence training completion rate (Figure 7b). Figure 7c shows that increasing Tdt slightly increases the time for rise, thus taking 70 months to settle, which is also unacceptable. 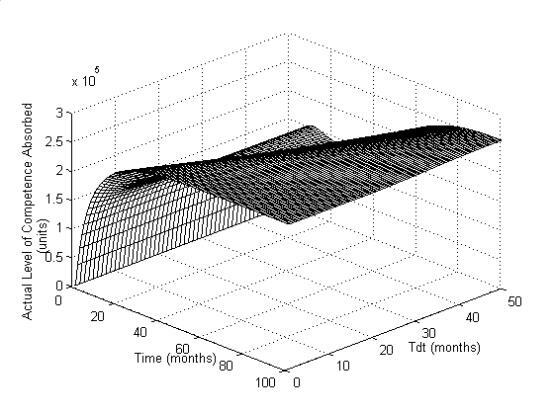 Figure 8 shows the response of Actual Level of Competence Absorbed for varying values of Tdr . 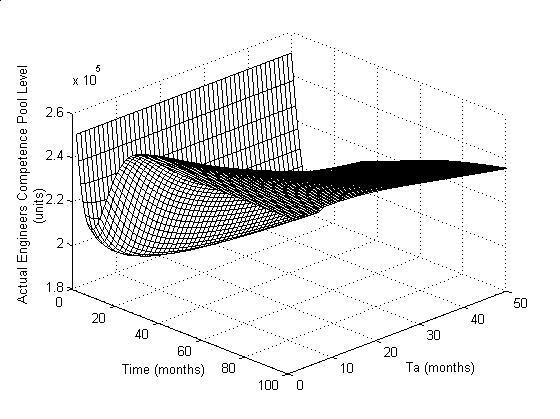 Smaller values of Tdr may allow quicker settling of the competence absorption, but at the same time induces unwanted oscillations, however, graph indicates that 3 – 6 months would be ideal. The detailed explanation of performance index based on the policy parameters is given in Table 1. A large group of researchers (Coyle, 1977; Towill, 1982; Cheema et al., 1989; Ferris & Towill,1993; Mason et al., 1995; Hafeez et al., 1996) have very successfully applied system dynamics in industrial system, customer service level, production control system, supply chain management, and efficient consumer response. This research work goes in similar lines and finds its use in studying the KM & HRM dynamics in engineering education system. Engineering is a very creative field, which encompasses the inculcation of a group of abilities including analysis, synthesis, designing, evaluation, experimentation, etc. Further, these skills are coupled with managerial and leadership qualities during the course of study. Hence, the current trend is to absorb engineers in IT industries irrespective of their branches. In fact, engineering has now become one of the most sought after professions in Asian countries, especially in India, where there has been a proliferation of engineering education since the past two decades. So there is now a compelling necessity to ensure that supply and demand balance with each other. In-built checks and balances become very essential to fill the ‘competence gap’, which by itself is dependent on several factors dealt in this study. 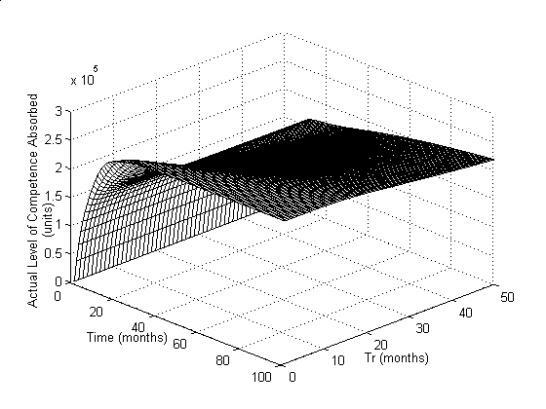 Therefore this model not only explains the system dynamics of engineering education system w.r.t. KM & HRM but also explains in detail the effects of four basic policy parameters viz. Ta, Tr, Tdt and Tdr. Higher education in general and engineering education in particular has a direct bearing on the economy of a country (Wald, 2001), owing to the fact that it produces the technical human resources who are responsible for the technological growth of the country. Globalization has now made it imperative that there is a need to produce engineers who are not only employable in the country but also meet the international technical manpower requirements. So in this connection the KM & HRM issues of engineering education become very important. Our study is a direct application of system dynamics into the KM & HRM issues of engineering education. The results reveal that present and future competency gap can be minimized through time effective competency training programmes. The COPM model developed in this paper shows the effect of the policy parameters Ta, Tr, Tdt and Tdr on the engineering competence pool. 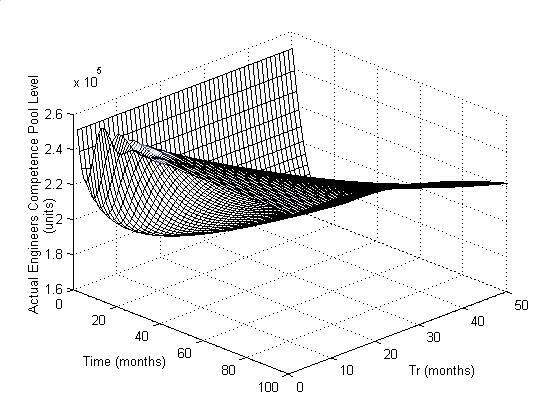 The simulation also shows that the maximum time limit of 6 months to regain the competence loss could be very effective if the policy parameters are controlled suitably. Even though this model has been developed for engineering education, its application may be extended to other higher educational requirements. This study does not consider the effect of feedback or feed-forward on the recruitment rate but focuses on the development of engineering competence. So, the study may be further extended based on the system dynamics of recruitment, considering all the influencing factors such as socio-economical factors, influence of globalization, technological growth rate etc. Baker, J., C., Mapels, J., New, C. C., 1997, A Hierarchical Model Of Business Competence, Integrated Manufacturing Systems, Vol. 8; pp. 265-272. Bhatt, C., 2001, KM In Organizations: Examining The Interaction Between People, Processes And Technology, Journal of KM, Vol. 5, No. 1; pp. 68-75. Cheema, P., Towill, D., R., Bishop, B., 1989, A Combined Feed-Forward/Feedback ‘To-Make’ Model For A Multi-Product Machine Shop, Proceedings of the 5th National Conference on Production Research, Huudersfield: UK; pp. 101-105. Coyle, R.G., 1977, Management System Dynamics, John Wiley & Sons, London. Ferris, J., S., Towill, D., R., 1993, Benchmarking A Generic Family Of Dynmic Manufacturing Ordering & Control Models, Journal of Systems Engineering, Vol. 3; pp. 170-182. Forrester, J. W., 1961, Industrial Dynamics, Cambridge: MIT Press. Hafeez, K., Abdelmeguid, H., 2003, Dynamics Of Human Resources And Knowledge Management, Journal of the Operation Research Society, Vol. 54; pp. 153-164. Hafeez, K., Griffiths, M., Griffiths, J., Naim, M., M., 1996, System Design Of A Two-Echelon Steel Industry Supply Chain, International Journal of Production Economics, Vol. 45; pp. 121-130. Mason-Jones, R., Towill, D., R., Hafeez, K., 1995, Dynamics Of Pipeline Control, Proceedings of XIV Operational Management Conference, Israel, 10-13 July. Neef, 1999, Making The Case For Knowledge Management: The Bigger Picture, Management Decisions, Vol. 37, No. 1; pp. 72-78. Nonaka, I., Takeuchi, H., 1995, The Knowledge Creating Company: How Japanese Companies Create Dynamic Innovation, New York: Oxford University Press. Raub, S., Rulling, C. C., 2001, The Knowledge Management Tussle – Speech Communication And Rhetorical Strategies In The Development Of KM, Journal of Information Technology, Vol. 16, No. 2; pp. 113-130. Routledge, 2000, Concise Routledge Encyclopaedia of Philosophy, New York: Routledge. Sheshagiri, M., 2004, Gearing Up For The GATS, Education Times, Bangalore Edition, August, 16; pp. 11. Senge, P., M., 1994, The Fifth Discipline: The Art And Practice The Learning Organization, Doubleday: New York. Sushil, 1993, How To Develop A System Dynamic Model?, System Dynamics, A Practical Approach For Managerial Problems, ISBN: 81-224-0498-7, Wiley Eastern Publication. Towill D., R., 1982, Dynamic Analysis Of An Inventory And Order Based Production Control System, International Journal of Production Research, Vol. 20; pp. 671-687. Tripathi, P., C., (Ed. ), 2002, Acquisition Of Human Resources, Human Resource Development, Sultan Chand & Sons, New Delhi. Turban, E., Aronson, J.,E., (Eds. ), 2002, Knowledge Management, Decision Support Systems And Intelligent Systems, Pearson Education, ISBN 81-7808-367-1. Wald, M., 2001, Engineering Education, Globalization & Learning Styles, International Journal of Engineering Education, Vol. 17, No. 1, UK: Tempus Publication ISSN 0949-149X; pp. 1. DECPL = Desired Engineers Competence Pool Level = 250000 units. AECPL = Actual Engineers Competence Pool Level. CTRATE = Competence Training Rate. FGCFR = Forecast Graduate Competence Fail Rate. Tr = Time over which the competence gap is to be recovered. Ta = Average time to determine the forecast competence loss rate. PGCFR = Present Graduate Competence Fail Rate. CTCRATE = Competence Training Completion Rate. Tdt = Competence Training Delay Time. ALCA = Actual Level of Competence Absorbed. Tdr = Recruitment Delay Time. Mr. Lewlyn L. R. Rodrigues is a Ph.D. scholar in Knowledge Management & Human Resource Management at Manipal Academy of Higher Education, Manipal, India. He is widely pub;ished and is the recipient of several best paper awards and ‘Award of Excellency’ from the Labour and Social Affairs, Bahrain. Mr. Morvin Savio Martis, is a M.Tech. student at Manipal Institute of Technology working on his thesis under the guidance of Mr. Rodrigues. He is B. E. in Mechanical Engineering. His is currently working on his dissertation of M.Tech. in Engineering Management on System Dynamics of HRD & KM.